RTXI uses a two thread approach in which a real-time thread executes all real-time tasks and a non-real-time thread handles asynchronous events related to user input and the graphical interface. 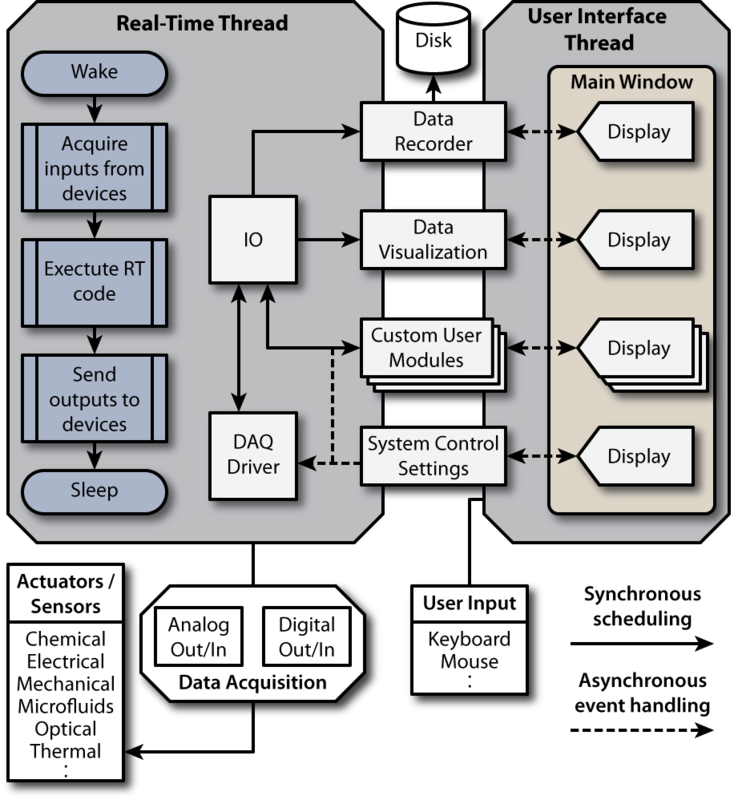 The Real-Time eXperiment Interface (RTXI) is a collaborative open-source software development project aimed at producing a real-time Linux based software system for hard real-time data acquisition and control applications in biological research. We are part of collaborative effort that has developed and successfully used this software to perform real-time biological experiments. The ability of experimentalists to perturb biological systems has traditionally been limited to rigid pre-programmed protocols or more flexible, but reflex constrained, operator-controlled protocols. In contrast, real-time control allows the researcher to dynamically probe a biological system with parameter perturbations that are calculated functions of instantaneous system measurements, thereby providing the ability to address diverse unanswered questions that are not amenable to traditional approaches. Real-time control applications are abundant throughout biological research, including, for example, dynamic probing of ion-channel function, control of cardiac arrhythmia dynamics, and control of deep-brain stimulation patterns. Unfortunately, for a number of technical reasons, real-time control is not possible with standard computer operating systems and software. Furthermore, commercial real-time systems are costly and often tailored for industrial applications. To circumvent these limitations, we have developed RTXI, a fast and highly versatile real-time biological experimentation system which is based on Real-Time Linux, is open source and free, can be used with an extensive range of experimentation hardware, and can be run on Linux or Windows computers (when temporarily booted into Linux using an RTXI Live CD). You can learn more about RTXI on its website, at www.RTXI.org. We use RTXI as a platform to probe the dynamics of cardiac cells through a technique called dynamic patch clamp. You can learn more about this technique and how our lab is using it here. 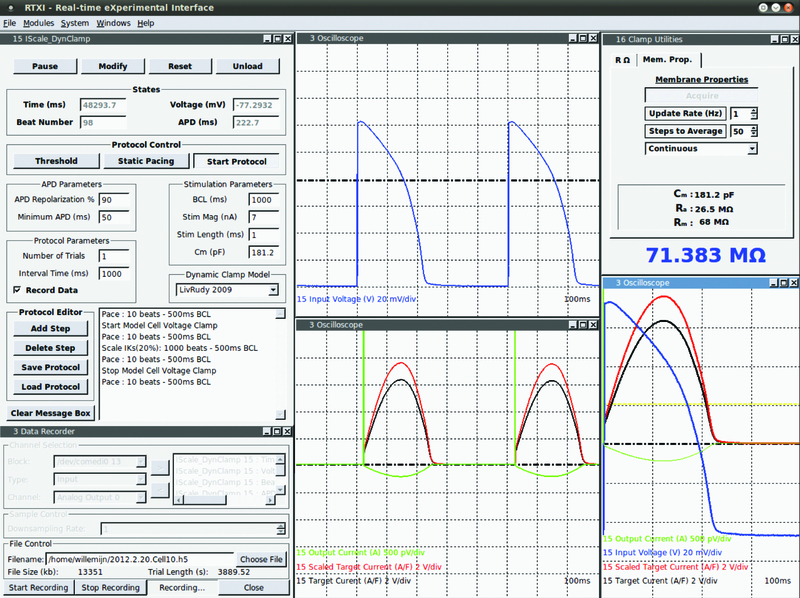 An example screenshot of RTXI being used to perform a dynamic clamp experiment artificially scaling different ionic currents in a single cardiomyocyte.